Yesterday was a typical day in Swaziland. It’s incredible how so many human emotions can be felt in one day, always leaving you emotionally exhausted. Yesterday was just another one of those days. It started scary. Ian and I were having breakfast when I suddenly choked on a piece of toast. There was no air going in to my lungs and we looked at each other in a panic. He asked me if I was okay and I shook my head “no”. He asked if I needed help and I nodded, unable to get an ounce of air in to my lungs. Ian quickly starting doing the Heimlich maneuver and after 6 or 7 tries finally dislodged the bread. It took me at least 10 minutes of terrible coughing to get to a place of normal breathing, and I was left with a splitting headache (even as I type this a day later). I am thankful to be alive and thankful that Ian was there and knew what to do. Shortly after that I got a call from Brooke saying that a woman from the farm had just given birth and the newborn was tiny, alive and at the El Rofi Medical Clinic. What?? I jumped on an ATV, flew down to the baby home to pick up clothes, diapers, blankets etc, and then proceeded (at the speed of light) to the clinic. Sure enough, there was a brand spankin’ new baby boy weighing 2.46 KG (5.4 lbs – which is a good sized baby here). The mother was working picking green beans on the farm on a very hot sunny day. She was dizzy and thirsty so went to her Supervisor for some water. The Supervisor sent her to the medical clinic located about one mile from where she was picking. As she walked along the new Living Water Dam when she had to stop because a baby was coming out. She delivered the baby on to the dirt (alone), wrapped the baby in the skirt that she had wrapped around her pants/trousers then delivered the placenta. She found a hole in the ground and dumped the placenta in the hole, then proceeded to walk to the clinic. As she passed the Kufundza Carpentry center one of the workers (named Fortunate) saw the woman and came out to help her. She carried the baby while the two made their way to the clinic. When she arrived Brooke and Sister Grace were there. Grace pointed at the wet child wrapped in a skirt and said, “What is that?? Is that a baby? !” The answer was yes. The mother thought she was only 3-months pregnant. Nope, she was wrong. Beth Blaisdell also just happened to be giving a tour of the clinic to Ali and MacKensie from Cox-Curry who are visiting from Georgia. It’s always fun to have outside “witnesses” to the crazy things that happen here. Brooke carefully wiped the dirt off the baby and clamped the umbilical cord, weighed him and then called me. The calmness and professionalism that Brooke ALWAYS exudes, never ceases to amaze me. She is a rock star. The mother went and washed while we all looked at the baby. I congratulated her, called Ken to drive her to home and then realized I was almost late for my next appointment. I hopped back on my ATV and flew up to the Project Canaan Academy Primary School where the foundation was being poured. Our wonderful friends at WLA (Women Leaders in Action) provided the funds to get the Primary School underway and we were honored to have the founder of WLA, Pam Joseph, here for the laying of the foundation. WLA also funded the Preschool and Kindergarten buildings. We had Head teacher, Amber VanWinkle, along with the children who are currently in the Kindergarten class, all present for the big event. They all got to put their hands in the wet cement and then write their names on the first classroom floor. Next we moved them to a separate piece of wet concrete where the first 3 students who will attend Primary School placed their right hand in the concrete. Amber, Pam and Ian followed and that piece will be designed in to the wall or walkway of the Primary School. From there Ian and I made a quick drive in to town to buy 5 buckets of KFC and 66 chicken strips for the Emseni kids and all the Children’s Campus staff, a treat for all thanks to Pam. The chicken was delivered, the big kids settled in with our guests for movie night at The Oasis and Ian and I came home, closed the gates, turned on the electric fencing, let out the dogs and crashed on the couch. Live from Swaziland … every day is a gift from God. 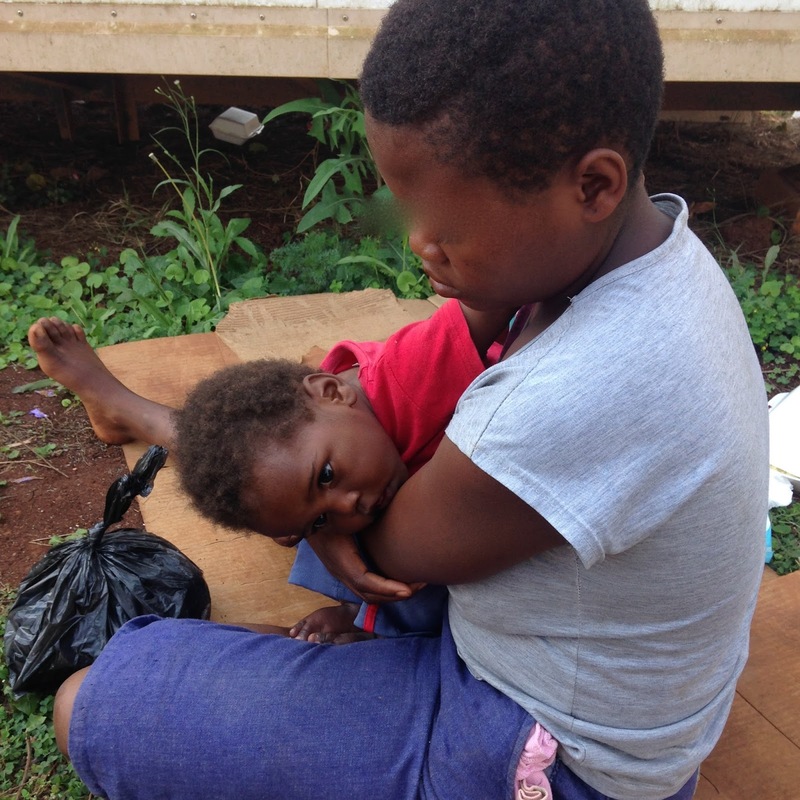 I always hoped we would not have to say “no” to a child in need, but this week it happened. There are certain criteria that we have when accepting children, but it is more age related than anything else. We welcome children who are HIV positive and even those with serious medical conditions that require hospitalization or surgery (see last week’s story about Phephile http://janinemaxwell.blogspot.com/2015/09/2-year-old-has-five-breaks-in-her-right.html or River’s story at http://janinemaxwell.blogspot.com/2015/06/baby-river-is-home-after-7-surgerys-and.html). Our focus is accepting children under the age of 12-months. We have made a few exceptions to that rule including Gabriel, Rose, Grace, Jared, Thando, Junior and Phephile, but for the most part we accept small babies. In fact 50% of our children arrive under 30-days old. All of the children will stay with us until they finish high school and find their way in to University, vocational training or find employment. Another guideline that we have is that we do not knowingly accept severely disabled children. We do not have the staff or expertise to manage children with disabilities and the Social Welfare officers know what our guidelines are. That being said, we do have two children who are blind (Grace and Michelle) and we have another 10% of our children who have some kind of long term disability, typically Cerebral Palsy related, that was not identified until the child was old enough to be assessed. I was called about an urgent case of a 9-month old child who needed help. I asked about the child’s health status and was told that the child was fine, just couldn't sit by himself, but that was likely due to his malnourished state. I was asked to come immediately while a court order was being sought. I took Welile (our baby home Sr. Supervisor) and Chris Cheek so that we could assess the child in person. Things are not always as they are told to us on the phone. We drove for 2 hours and found the child sitting on a piece of cardboard outside the Social Welfare office. Immediately we knew that things weren’t as we had been told. The child was actually 1-year old and we instantly knew that he was totally blind. We asked the mother if he was born that way and she said, no. He had large bumps down one side of his body and ended up in the government hospital for 3-months. He became blind during that time. He had no muscle tone at all in his body and his head flopped from side to side as his mouth moved in a very strange way as his head fell backwards. His diaper was simply a plastic grocery bag and he needed to be changed so Welile offered a diaper and wipes. When the mom wiped his bottom we saw huge scars where much of his right buttocks had been removed. 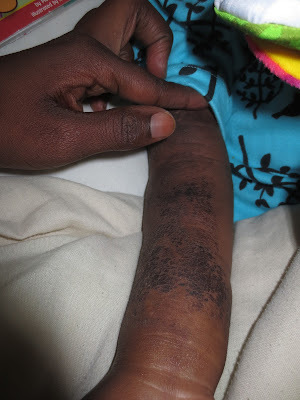 We were shocked at the site/sight and when we asked her about it she said that the hospital had cut some of the lumps out and that is how the scaring happened. Then I asked to see the child’s health card. That is when we saw the worst of it – he had Tuberculosis (TB) and he was not on treatment (which is free here). He had a terrible cough and was a sick little boy. Sadly, none of the mother’s stories seem to add up. Each sentence would contradict something that she had just said so we really weren’t able to get an accurate history. As Welile, Chris and I discussed the situation and it was clear that this child needed help, but it was not help that we could give. Bringing a sick, coughing child with TB into a home with 101 others, many who are immune compromised, would be a disaster. “bumps” were a result of having TB - severely swollen/abscess glands are common. We are assuming that the child had meningitis (brain infection) while in hospital which caused the blindness and the Cerebral Palsy-like symptoms. We really don’t know what is going on at home and don’t have any confidence that the story told to us by the mother is in any way true or accurate. Social Welfare has more investigating to do in this case. 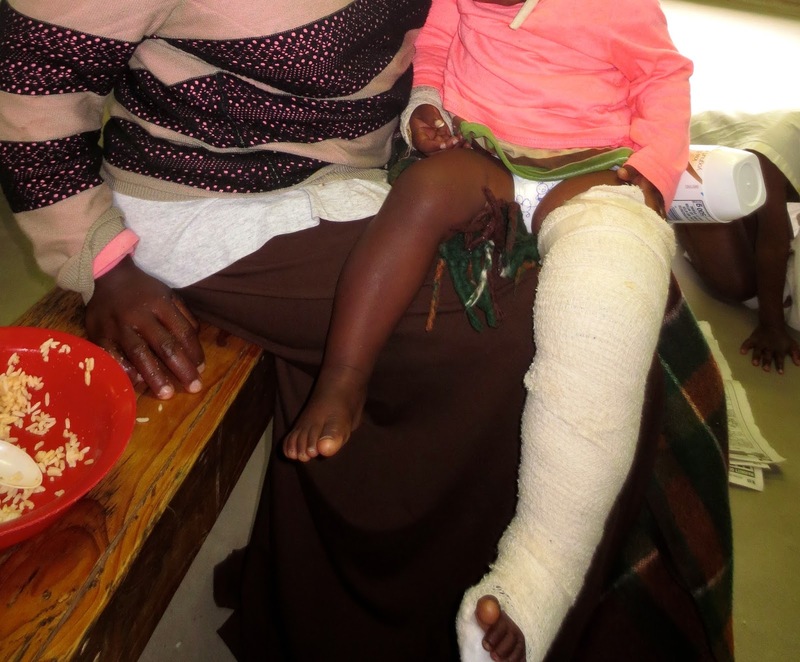 We gave the mother some money from my Compassion Purse and drove back to town where Phephile was getting a hard plaster cast on her broken leg. Wednesday was a tough day, but I do know that we can’t save everyone. We are called to be prayerful about who comes to the home and protect those who have been placed in our care. I will continue to pray for this child, his mother and others who are in desperate need. And I will continue to give thanks to the God who sees and ask that HE provide His comfort to us all. 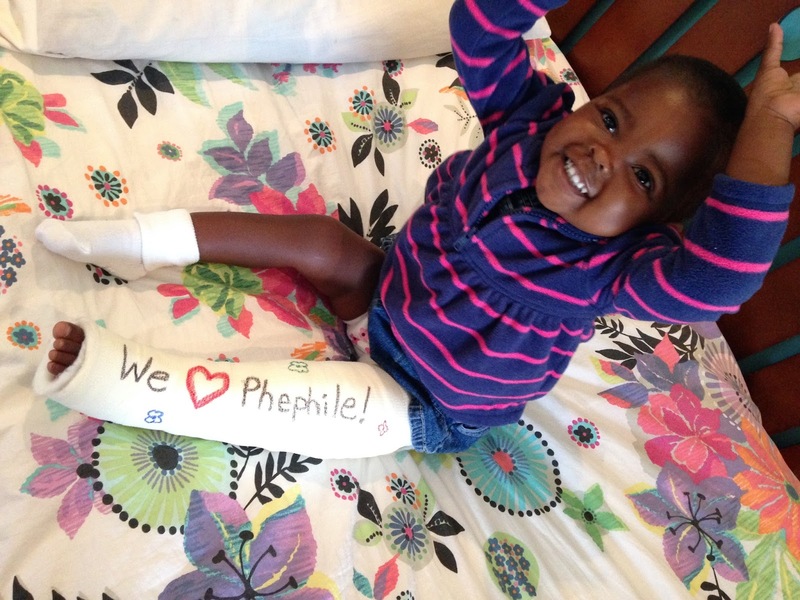 Live from Swaziland … the good news is Phephile is doing well and now living at the toddler home. Raising 101 children is expensive. I hate putting my hand out and asking for money/donations. Most of you will buy Christmas gifts for friends and family this year. I am asking you to buy Christmas gifts from Heart for Africa where 100% of the profit goes back to buying diapers, formula, food, and paying for caregivers, nurses, doctors and education. It’s not a donation, it’s Christmas shopping made easy. We have 54 full time employees at the Khutsala Artisans shop on Project Canaan in Swaziland, Africa. They have been working since January to make Christmas tree ornaments to help with our goal of becoming self-sustainable. We have 12,000 ornaments made, they are in the US now and ready to ship to you! They are flat, they fit easily in a Christmas card, they can be used as a decoration on the top of a gift, they are the perfect teacher gift and they are only $10 each. Each Star has 790 beads, and uses 12.5 feet of wire. Each Tree has 460 beads and uses 12.8 feet of wire. Each Angel has 560 beads and uses 23.3 feet of wire. Each ornament takes approximately 4 hours to make. Thank you for reading, thank you for shopping and thank you for sharing. Live from South Africa … celebrating Ian’s 50th birthday this weekend.